Rabbi Ovadia explains some of the psalms with explanation. Psalms are full of ... Maggiori informazioni expression, love, sadness, hope, and many more. Some read psalms daily, weekly, in time of need, in tragedy, in celebration, to express what's in our hearts and minds. Loosely translated as "legends", Aggadah includes the genres of biblical exegesis, stories about biblical characters, the lives of the Talmudic era sages and their contemporary history, ... Maggiori informazioni parables, proverbs, and folklore. A captivating melange of wisdom and piety, fantasy and satire, Aggadah is the expressive medium of the Jewish creative genius. 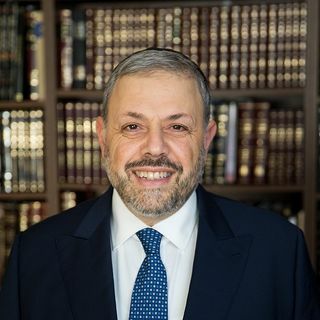 - Rabbi Haim Ovadia is the Rabbinic leader of the Magen David Sephardic Congregation in Rockville, MD. How does a Rabbi weigh his responsibility to Jewish law, to the sensitivities of the people involved. Difficult questions are usually never ... Maggiori informazioni black and white. Iraqi Jewish Songs for Special Occasions, shabbat and Holidays נוסח יהודי בבל. Rabbi Ovadia's parents were from Iraq, before moving to ... Maggiori informazioni the State of Israel. From a young age, he was gifted with being taught the many beautiful tunes of his ancestors. These were used in the synagogue on Shabbat and Jewish Holidays, at home, as well as at happy and sad occasions. Rabbi Haim Ovadia speaks about a plethora of topics on Passover. He discusses the Wondrous Passover Seder, legumes for all, history of the ... Maggiori informazioni holiday, sensitive toward others, and how to live in today's world. Keeping kosher seems like it gets more burdensome over time. It's not that true kashrut has changed, but rather Rabbi's and kashrut ... Maggiori informazioni organizations continue to raise the bar. But, is raising the bar a good thing? Is it that our ancestors were ignorant to the laws of kashrut? Or is it the fact that kashrut has become a business? Certifying toilet paper should tell us we have gone way too far. Course Objective- "To understand the historical and social context and identify the message or hidden message". In this series, he ... Maggiori informazioni analyzes select sections from Midrash. "Rabbi Ovadia ha trabajado a través del mundo como rabino y como hazan, y esta ... Maggiori informazioni extremadamente familiarizado con las tradiciones sefaraditas y las liturgias de las comunidades iraquí, marroquí, persas, sirias y yemenitas.